Sure, there are trolls out there - but don't rule out productive conversations with others because of them. My finger hovered over the “submit” button, but hesitated. “Don’t be mean,” I thought to myself. I deleted the snark off the tail end of my rebuttal and re-framed. The modified post still smacked of frustration but at least didn’t take it out solely on the questioner. The enduring lesson from this exchange isn’t that the commenter conceded his point, but rather that I almost blew it. I was bracing for a fight, but this person was simply misinformed. I narrowly escaped the trap of attacking someone who had simply made a mistake. Can you tell a wiseass from someone with a genuine question? When faced with someone who appears dubious about widely accepted climate change science, how do you weed-out a hardened ideologue from someone with more genuine intentions? The answer lies right before us, but it’s one I missed in the exchange above. Even a single follow-up question, like “What makes you think that?” may be enough to illuminate someone’s perspective. Is a person expressing doubt, trying to learn more, or simply setting the stage for a deep dive into the latest conspiracy theories? The previous article in this series explored the “spectrum of persuadability,” and how people resist climate change information for a variety of reasons. Not every person who has their facts wrong is a full-throated flat-earther. Some are casually repeating a tidbit they’ve heard. Others may not have given climate change much thought at all, and they may just have unresolved questions, doubts, and fears. People who are noncommittal on climate change are likely open to new information, but their receptiveness warrants extra caution. Ungracious, condescending, or negative behavior from those trying to defend climate science can be counterproductive, a huge turnoff, slamming the door on a rare opportunity. Hannah Pickard answers the phone in a cheerful voice from her office in Boston’s New England Aquarium. “I’m sitting right here on the harbor,” she says of her enviable locale. 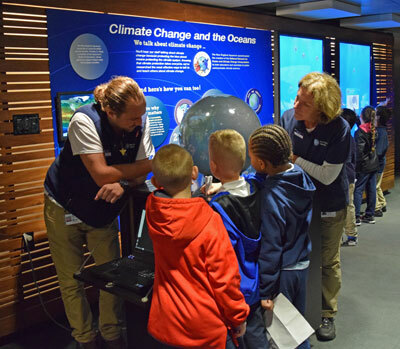 Danny Trifone of the New England Aquarium engages some young visitors in thinking about how the ocean is the heart of our climate system and how we must protect the ocean heart to bring the climate system back into balance. These venues offer a quietly powerful way for people to learn about nature, science, or their local environment. Climate change is a regular part of the conversation. “Informal education reaches 150 million people every year,” says Pickard in an upbeat tone. Better yet, people tend to come to these places in a mood for learning. “We have this awesome opportunity,” she says. Pickard and her colleagues worked with the FrameWorks Institute, a communications thinktank, to test various approaches for engaging people about climate change. They’ve come up with strategies that can be adopted not just by museums and parks, but by many others too. After gauging someone’s starting place, Pickard recommends nudging them toward a re-framing that retains the essence of their original concern, but offers a more productive way of thinking about it. But the challenge can be re-cast. “Americans are innovators and problem solvers,” suggests Pickard. The sentiment is not a hard sell; most people would already agree. 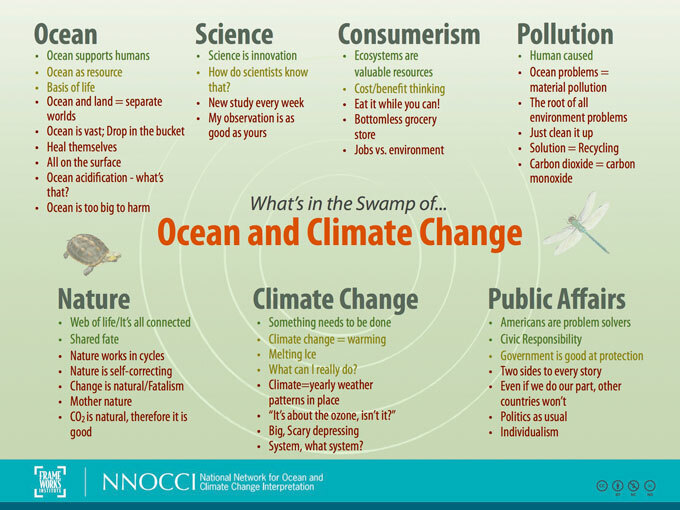 NNOCCI and FrameWorks Institute have developed an infographic that illustrates their research, juxtaposing the many unhelpful ways of thinking about climate change (in red on the illustration above), with increasingly productive views at the top of each list. The goal is to steer conversations into the green topics to allow for solutions-thinking. An exhaustingly common point of confusion on climate change is that it’s all part of a natural cycle (this myth was addressed in the first article in this series). This misconception can be tough to dislodge because Earth does have natural cycles, so the adage is partially true. Which, in the end, doesn’t really make it true. “Instead of ‘just a cycle,’ explain that we’ve thrown natural systems out of balance,” advises Pickard. The wisdom of this approach is that it doesn’t attempt to reverse an existing belief; it uses it as a foundation to build from. The Earth indeed has cycles, but excess CO2 has interrupted the natural ebb and flow. “It’s no longer a cycle, it’s a ramp,” she says. Another frequent comment by museum visitors is that CO2 is natural, therefore it can’t be bad. “Should I stop breathing?” quips Pickard with a chuckle, replaying a typical conversation. The idea of “regular vs. rampant” can help draw contrast between natural CO2 and human-caused emissions. “We now have a new source of CO2,” Pickard explains, “and those levels keep going up and up.” It’s a play on the “too much of a good thing can be a bad thing” line, and therefore readily understandable and often easily accepted. But Pickard is careful to not linger in doom and gloom. She circles back to our affinity for natural cycles: “The good news is we’re already working to get the system back in balance,” she says. Our brains have a hard time embracing problems that appear to be unsolvable. Part of why climate change has been a poster child for inaction is that solutions have been deliberately portrayed as unpalatable or ineffective. “Emphasize people’s ability to solve difficult problems with innovation and ingenuity,” reads a suggestion from a blog post describing NNOCCI’s approach. But Pickard is quick to note that personal lifestyle changes fall far short of addressing the problem. “Recycling [alone] is not the answer,” she says. Instead, be realistic that the scale of the solutions needs to match the scale of the challenge. Ideally, point to policy efforts going on in your own community so that people have a pathway to support or join existing projects. “Solutions at the community and state levels get the most traction,” says Pickard. “Local issues help people feel directly connected,” while dodging the quagmire of national politics. Want to boost the effectiveness of your climate conversations? * How to Talk about Climate Change and the Ocean – Research-based strategies for conversations. * Expanding Our Repertoire: Why and How to Get Collective Climate Solutions in the Frame – Productive ways to talk about solutions, while avoiding common pitfalls.